How to export Gerbers with Eagle? Hello, I just got my printer and I already print the “Hello World” example. It came up very good. I’m looking a step by step tutorial, of how to export a PCB from eagle to the printer. Is there anything about that online? Hi @efrag! Glad to hear you had a positive experience with the V-One. If you’re looking to export from EAGLE, we actually have a few files available which will speed the process along. I’ve attached both below. Before exporting your files, have a look at the Circuit Design guidelines and the Eagle Export guide to make sure things will print nicely! From the layout file, go to Tools>DRC in the toolbar. Click the LOAD button, and select Voltera_DRC.dru. Correct any errors that EAGLE identifies. Open your board in EAGLE. Run the CAM Processor - Navigate to File>CAM Processor. Within the CAM Processor window, select File>Open>Job…, and select the Voltera CAM file. Click ‘Process Job’. This will generate the gerbers and save them in the same directory as your .brd file. I'm using the free version of Eagle. I just tried this Voltera_DRC.dru and when I click "Check" I get the error "The layer setup contains layer 2, which is not available in the Standard edition". If I just click OK, it does appear to run the DRC because I get a list of errors. What I'm wondering is if this warning/error dialog will in any way invalidate the output of the DRC? Hi @Leland! Glad to hear from you. The error you're seeing won't affect the DRC, unless your design includes the layer in question - which seems unlikely, considering that the free version doesn't support it. OK, great, I grabbed the new file. I've been working on a layout and when I run the DRC I'm getting errors that I hope you can help me with. There are two main classes of errors: Angle and Clearance. I'm getting clearance errors on the pads of an LSM303DLHC. This is a standard part. I believe the only thing I did was place it within the board, rotate some and then run the autorouter. Is there a way around this? Or should I ignore the clearance errors? My hunch is that these are caused when I rotate a part. But I've not tested this yet. I'm not sure if you're still keeping up with things over the weekend (and that's fine). By the time you see this, I may know more. I'm going to follow my hunch for now and try another board. Oh, one other error is "No Vector Font". Can I add a font to Eagle to get around this? @mewertow, I think some of this might be my lack of understanding of Eagle. I've been googling and found some tutorials that I hadn't read before and I think I've figured out some of this. At any rate I've learned a lot today. So if I figure this out before you see it, I'll keep you posted. Oh, and feel free to ignore anything not Voltera related. The DRC's job is to alert you to features which may be suspicious, but whether or not they will impact your design depends on the context of the error it has located. The errors you're running into are pretty common, see below for description and recommendations. 1) Angle error - This error can often point out unintended routing, since most intended angles will be 45 or 90 degrees. The little lines you are seeing usually happen when you move the part around (as you've mentioned), or when clicking multiple times when trying to route to a pad. While these aren't ideal from the perspective of keeping a clean layout file, they won't typically impact your design, since the V-One software actively attempts to filter out these artifacts. 2) Clearance error - This error pops up when two features are closer than the minimum limit of in the DRC - for pads, this is set to 0.6mm, and is intended to catch IC pads that have a pin pitch below 0.65mm. 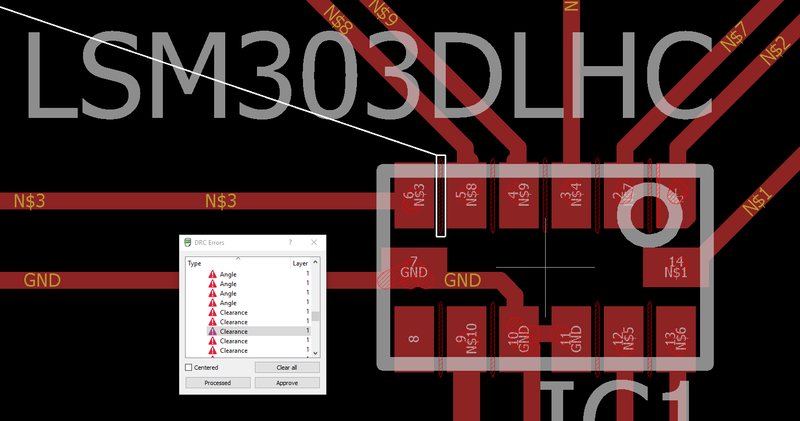 However, in this case, you should be in good shape - looking at the LSM303DLHC datasheet shows that the pin-to-pin pitch is 0.8mm, with a pad width of 0.5mm. The DRC is throwing an error because the gap between the pads is right on the edge of the 0.6mm cutoff in the DRC settings, although your design should be within spec for printing with the V-One. In this case, the DRC erred on the side of caution. 3) No vector font - this error comes up when the DRC detects text that is not written in EAGLE's vector font. To fix this, right click on the text, select 'Properties', and change font to 'vector' (default is 'proportional'). That helps a bunch! It's also very good news since I'm not as far off as I feared.